Sassool: "Welcome to Our Home"
A week ago, my husband and I were treated to a delicious evening at Sassool-Cary. We had the most wonderful experience thanks to Simone, who, together with her family, works tirelessly to produce the freshest, highest quality, and most tasty food. The story behind Sassool is quite inspiring! The Saleh family has been blessing their communities with their mouthwatering family recipes since the 1970’s and you can taste every single ounce of history in their food. Named after Cecelia Saleh aka “Sassool”, this little piece of the Mediterranean is adored in the triangle, with locations in Cary, Raleigh, and the new Morgan Street Food Hall! I’m so excited to be telling you all about our experience and the amazing food! One of the hardest things about eating a whole foods, plant based, diet is eating out. and I can guarantee this is a common feeling among the veg-community. We LOVE to eat out as a family and with friends. And being that we are from Michigan, we have family visit a few times a year and I always get excited to plan out where we are going to eat. It can be so hard, and sometimes seemingly impossible, to find a restaurant that can satisfy everyone’s palates and dietary needs. Until recently, most places included a veggie dish as an afterthought and included things like: steamed vegetable of the day, or a plate of raw tomatoes (NOT KIDDING! This was actually the “Vegetable of the Day" at a place I will not name here). Listen, I love cooking and coming up with recipes but I have no formal culinary education so I can say with quite a bit of certainty that it is not difficult to put together an actual meal that consists of vegetables, grains, pastas, etc. Vegan and vegetarian diners are a growing population and frankly we are quite annoying and demanding! WHAT DO WE WANT?! VEGAN OPTIONS! WHEN DO WE WANT IT?! NOW! 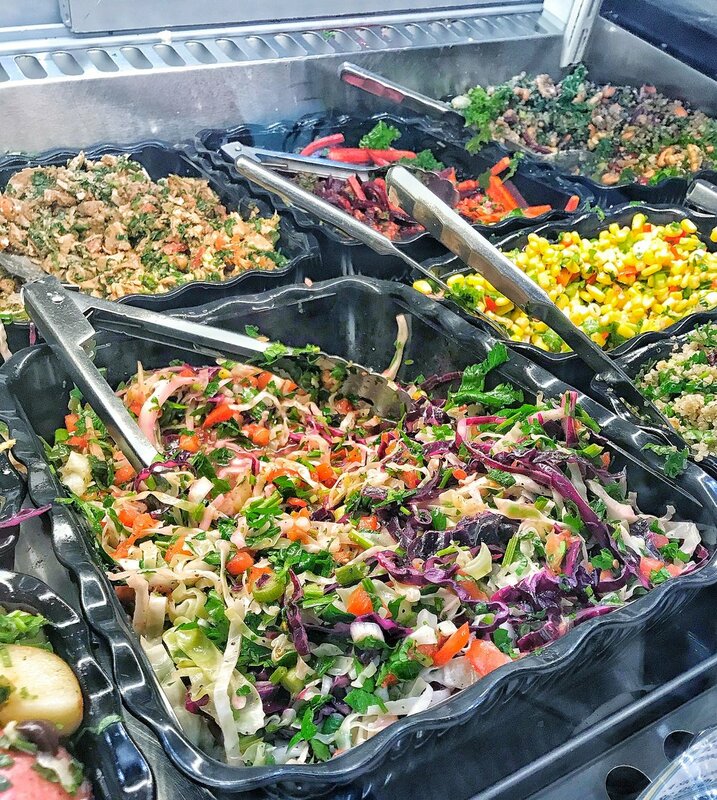 In all seriousness though, Sassool not only offers FRESH vegan and vegetarian options but they offer an ABUNDANCE of vegan and vegetarian options. Simone actually told me that a lot of their dishes are just naturally free of animal products. This is exciting because as someone who suffers actual painful side effects from eating meat and dairy, I don’t have to worry about something being mislabeled or “accidentally” containing something that will have me laid in bed the next day. However, there are plenty of dishes that will satisfy the meat-eaters in your life as well! That’s one thing, among many others, that makes this the perfect place to bring friends and families to satisfy everyone’s tummies! In fact my husband and I both agreed that had we had access to a place like Sassool when we got married, it would have been the perfect catered food for our guests! If you are planning a party or wedding or even just a holiday gathering and you don’t feel like dealing with the stress of planning a menu, I HIGHLY recommend Sassool for Catering! With dishes like Chicken Salad, the BEST hummus you’ll ever taste, seasonal dishes, sandwiches, traditional Mediterranean dishes such as tabouli, baba ghanouj and SO MUCH MORE, your guests will not be wanting for anything. During our visit we both chose to order a platter and the servings were not stingy, y’all. Neither of us could even see the bottom of our plates after they were done piling on all of the goodness! My husband tried the Fattoush, Orzo Salad, Chickpea Salad, and Sweet Potato Salad. I devoured the Cabbage Slaw, Sweet Potato Salad, Hummus and a serving of Falafel with tahini sauce. After we finished every single bite on our plates we went back up for the VEGAN STUFFED DATES. Now if you’ve read my blog or follow me on social media you know that Dates are maaaaybe, possibly, most definitely my favorite food. So to be at a restaurant with a LABELED vegan date dessert?! DREAM COME TRUE, Y’ALL! These dates were a thing of dreams. Stuffed with Halava—a sesame seed paste, strawberry jam, and then topped with sesame seeds—they were unbelievable. You cannot go to Sassool and leave without trying one-or 10. I told Simone before we had to leave how impressed I was that she and her family were able to take their decades-old family recipes and scale them like they have without losing the integrity of the food. I’m not kidding when I say you can taste the freshness. You can taste that these are recipes that have stood the test of time and have been making folks happy for years and years—and there is no doubt in my mind that they will continue to do so. 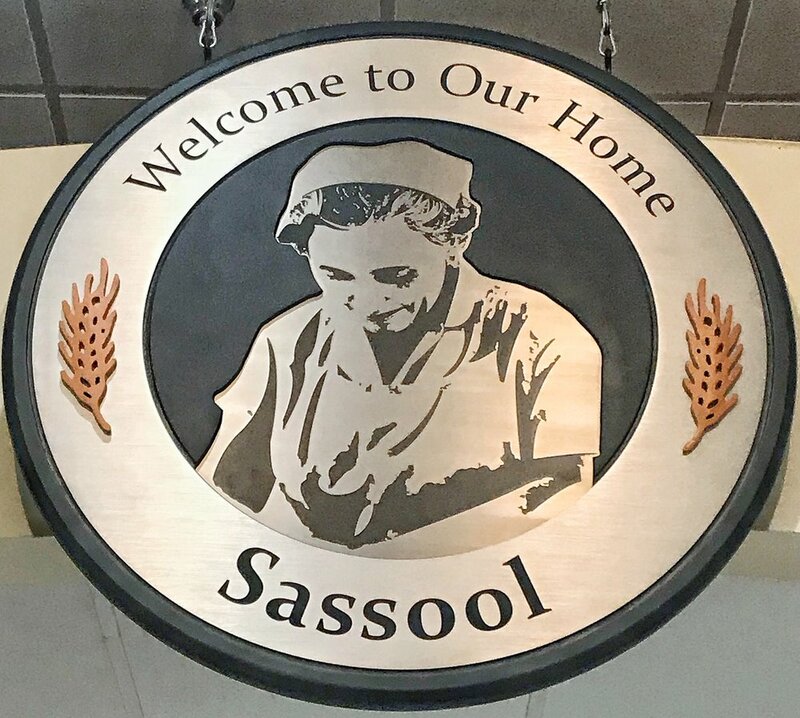 Our family is thrilled to continue to support Sassool and we hope you will too! A HUGE thanks to Simone and the whole Sassool Family, as well as Tabletop Media Group, for this opportunity and an unforgettably tasty evening! Going Plant Based in 2019?! This one’s for you!